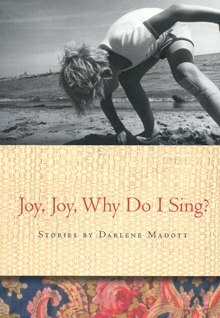 Darlene Madott - Book: Joy, Joy, Why do I Sing? About Joy, Joy, Why do I Sing? In this brilliant collection of short stories, Darlene Madott explores the individual quests of characters to sing themselves out of the void - to seek a motivation beyond the confines of their personal joys and sufferings. In the title story, the uniqueness is in the exploration of the notion that in the gift of singing, we pray twice: we celebrate the song, and we celebrate the creator. Madott's stories examine the relationships between people, within the understanding that one note in isolation means nothing; it communicates nothing. It is the interval - the relationship between two notes and how an individual moves from one to the other - that creates meaning. Sometimes there is consonance, but more often, it is dissonance that swirls between two people. The author describes this dissonance in one marriage as "the interval of a seventh apart." All of the stories possess a certain tugging at the heart, and at the core of each story it is love alone that transposes the music. "Joy, Joy, Why Do I Sing? [T]here's a literary convention of relevance - the elegy, and traditionally the elegy does have a distinct purpose, which is consolation. "Linked stories" are usually linked by the presence of the same protagonist, and this is true of Madott's collection, but in an odd way. There is a protagonist named "Franny" or "Francesca" who does appear in most, perhaps all, of the stories, but as readers we are not at ease in making this identification, because Madott's protagonist seems subtly different in each story. We're only sure these protagonists are the same women because certain details are repeated. In the last story, for example, the protagonist remembers tucking in her frightened young son on his first night spent with his father, now separated from his mother. That memory is evoked, almost verbatim, by the protagonist of a previous story. The close repetition is important because, again, the women doing the tucking in are not obviously the same women - perhaps because they are shown in such different contexts. These explicit echoes resonate throughout the stories, and they keep the reader alert…. In the first story, for example, the heroine says to her lover, "I'm no fun to be with." In the later story, she is told by an acquaintance, "You are hard to be with." The second comment almost forces us to return to the first story to look at its heroine in the light of the second story. In the end, we accept that these stories are basically about one person not so much because of the unity of character but because of the unity of mood. That mood is darkened by acts of treachery and deceit. The most striking instance is "The Question." In this story, a tour de force, the narrator, an unnamed lawyer whom we assume is Franny, because we know Franny is a lawyer, delves into the mystery of an old woman being sued by the descendents of her brother-in-law. It's narrated mostly in the form of courtroom cross-examinations, which become progressively more disturbing in their implications of dishonesty and perverse relationships…. Joy, Joy, Why Do I Sing?, with its highly concentrated prose, and its quiet intensity, maintains the poise necessary for contemplating these things. Sometimes the concentration and intensity become airless, but there are enough windows opened in the course of these stories - literally and figuratively - to keep the reader from a sense of claustrophobia. The author's own song continues, subdued but unfailingly musical, and successfully hinting at the obscure harmony of systems in the world."